Traditionally the quillow is a quilt that transforms into a pillow, hence the word "quillow." But these days you can make a "quillow" with really any type of a blanket. In this tutorial, we show you how to make a simple fleece quillow, so it's a fleece blanket that folds up to become a fleece pillow. This is the perfect project to make on cold, wintery days but it's also great to give these to friends and families for gifts. 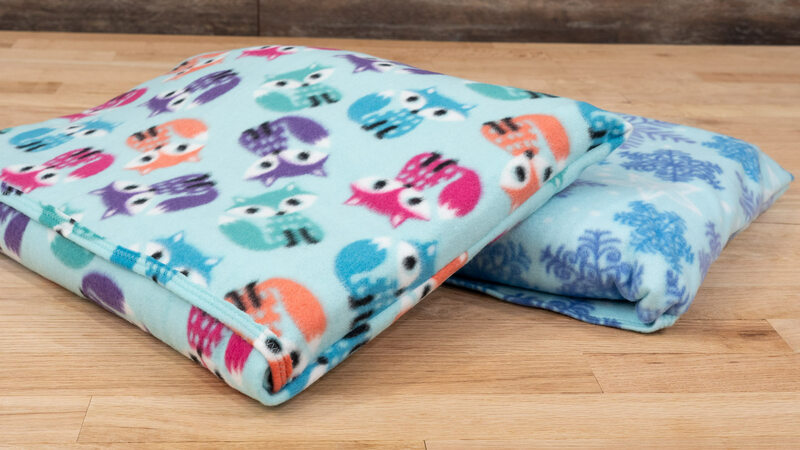 During the winter months, fabric stores are stocked with all types of adorable fleece fabric and any of them would make a wonder fleece quillow. Fleece is a fabric which doesn't fray so it's not really necessary to finish the edges but I do it to make it look more professional. Folding up your fleece quillow into it's pillow form is a snap and makes it super easy to store and travel with. Make one today! You are correct. at around 1 minute 2 seconds, the captions stated the opposite. This was a last minute change when we were creating the video and was not updated in the script. I am sorry for the trouble. It is corrected now so others will not have issues. I got very confused because the narration was the opposite of the closed caption. I figured the narration might be correct, but now I have the wrong side on the outside, so I will have to rip out and do the pockets again. Please post a note to correct the narration to save other people from having to re-do a Christmas gift on Christmas eve.